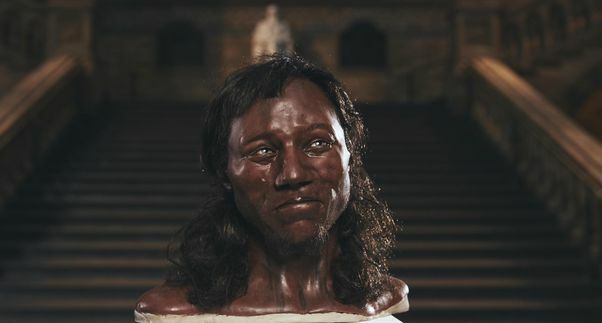 Reconstruction of the face of Cheddar Man: Channel 4. One of the reasons I love archaeology is the way in which it challenges us to recognise and rethink our preconceptions. It is very easy to live in the cosy world of today and focus on reassuring feelings of stability. Practices of mindfulness, among others, encourage us to ‘live for the moment’ and, amidst the insecurites of the present, this is not something with which I would wish to disagree. Nevertheless, I would add the caveat that there are also advantages to be obtained from a slightly longer term view and that perceived ‘problems’, when put into the context of past millennia, can diminish. One recent story has got me thinking about the way in which an understanding of change can benefit both our understanding of ourselves and our understanding of the world in which we live. Both have undergone dramatic changes over the past millennia – but sometimes we forget. On the 7th February, The Guardian was one of several papers to reveal, through DNA analysis of skeletal remains in the Cheddar Gorge caves, that those who lived in Britain at the end of the last Ice Age had dark skin and blue eyes. For some people this was quite shocking news, but it is hardly ground-breaking. In 2010 I was able to report on research by Professor Johann Moan at the University of Oslo that suggested that the prevalence of pale skin in northern Europe was related to a reduction in vitamin D in the diet around the time that people switched to farming. Since then, several studies in various countries have looked at different aspects of this. It is, however, information that has taken a while to leak out into the general understanding and, as such, the research, a project at the Natural history Museum, is important. It has caught the public eye (or ear). The research at Cheddar has been undertaken as part of a Channel 4 documentary looking at the study of ancient DNA. In the newspaper report the archaeological specialists take the opportunity to comment on the way in which their research sheds new light on our twenty-first century racial stereotypes; debunking, for example, the way in which we tend to regard skin colour as an indication of recent global origin. Varying skin colour, it seems, is a relatively modern feature of the human race, and its supposed links with geography are even more modern. It sounds as if the programme is going to be one to watch. Our hunter-gatherer ancestors are rarely afforded the luxury of a programme to themselves, and it is always good to see some of the more specialised aspects of archaeology laid bare. The study of ancient DNA is a complex subject that has, on occasion, been open to misconception. There is even a link to my own current work interests: the submerged landscape, known to us as Doggerland, that lay between Britain and the continent provides the context for the movement in to Britain of the communities of hunter-gatherers who came here at the end of the Ice Age. The ancestors of ‘Cheddar Man’ must have been among these groups. (Though I disagree with the Guardian reporter who called this landmass a ‘land-bridge’ – surely an area that stretched from north of the Humber to south of the Thames was more than a land-bridge?). It is nice, though, to be reminded that the world our ancestors knew was a very different world – a world, ironically, in which for much of the time Britain was physically part of the continental landmass. I still come across people who are not aware of this, so it is a message worth repeating. One thing does fascinate me: the title, apparently, will be First Brit: Secrets of the 10,000 Year Old Man. I think that I might feel slightly miffed if I were one of the many thousand people who lived here prior to 10,000 years ago, going back to those who left their footprints at Happisburgh on the Norfolk coast some 800,000 years ago. OK, so it was not known as Britain that far back, but it was not Britain 10,000 years ago either. The cynical might detect the use of hyperbole to bring in viewers. The programme press information justifies the use of the term ‘First Brit’ on the grounds that this is the oldest complete skeleton. The Natural History staff note that it provides the oldest complete DNA genome we have to date. You can tell that they are excited. I’m still concerned by the use of superlatives that will, inevitably, be superseded with time. I’d love to focus on the intrinsic interest of archaeology without dressing it up. But it gets the message across. And I know where I will be on the 18th February. Glued to the television!